The feature program of ACS’s Los Angeles Chapter is the Gray Whale Census and Behavior Project, the longest-running citizen science program of its kind in the world, incorporating conservation and education through research. 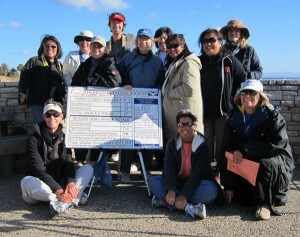 Started in 1979, this unique, shore-based study of the marine mammals that ply the waters off the Palos Verdes Peninsula is staffed by teams of trained ACS members and the local community. 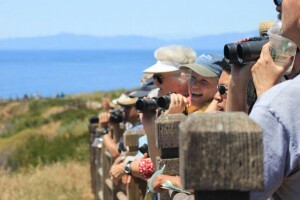 Many volunteers have been trained as naturalists through Cabrillo Whalewatch, co-sponsored by ACS/Los Angeles and the Cabrillo Marine Aquarium. The primary census station is at the Point Vicente Interpretive Center in Rancho Palos Verdes, CA, which is about 125 feet above sea level and where the water depth abruptly drops off close to shore. This census station operates from December 1st through May 15th during daylight hours, every day of the week. 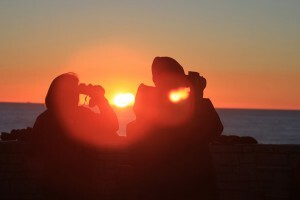 Experienced volunteers staff each shift, identifying and recording marine mammals and their behaviors, with a focus on Eastern Pacific gray whales. Because the majority of gray whales use offshore migratory routes in this area (primarily through the Channel Islands), especially on the southbound migration, only a small proportion of the total gray whale population is observed, so our counts cannot be used as the sole basis for population estimates. Instead, the project focuses on ascertaining seasonal usage of the near shore migratory path, and documents changing trends over time. The project places special emphasis on calf sightings in both the southbound and northbound migration, which helps track trends in calf recruitment. Spotters also detail migratory behaviors observed, including breaching, spyhopping, rolling, courtship, apparent nursing, possible feeding, and interaction with kelp and with other marine mammals. Participants also note possible human impacts on gray whales, including boat interactions, possible harassment incidents, and entanglements. In addition, they identify and record behaviors of any other marine mammals in these local waters. Our trained volunteers have recorded at least 20 other species of marine mammals. Data from the Gray Whale Census and Behavior Project is integrated in the Journey North Education Project, an online educational resource for the global study of wildlife migration and seasonal change. We also educate the public by answering questions from hundreds of visitors to the Point Vicente Interpretive Center. Additionally, we share our data with the National Marine Fisheries Service (NMFS), the federal agency responsible for conducting the official gray whale census and generating gray whale population estimates from this data. Since trends in data collected from the Gray Whale Census and Behavior Project closely mirrors data collected by NMFS, the agency utilizes our data to help determine the timing of their census and to provide information on migration timing and distribution when their census is not in operation. We have coauthored several publications. For more information about how you can become involved in this unique, fun, community-building activity that takes a ‘hands-on’ approach to whale conservation, please contact Alisa Schulman-Janiger, Project Director and Coordinator.